Hi Friends! I have been pretty absent from Wedding Wednesday lately, as I am trying to be a tiny bit discreet about some of the details. A lot of my family members read this, and I don't want to spoil it. However, rest assured that I will share this stuff with you, especially the DIY stuff. 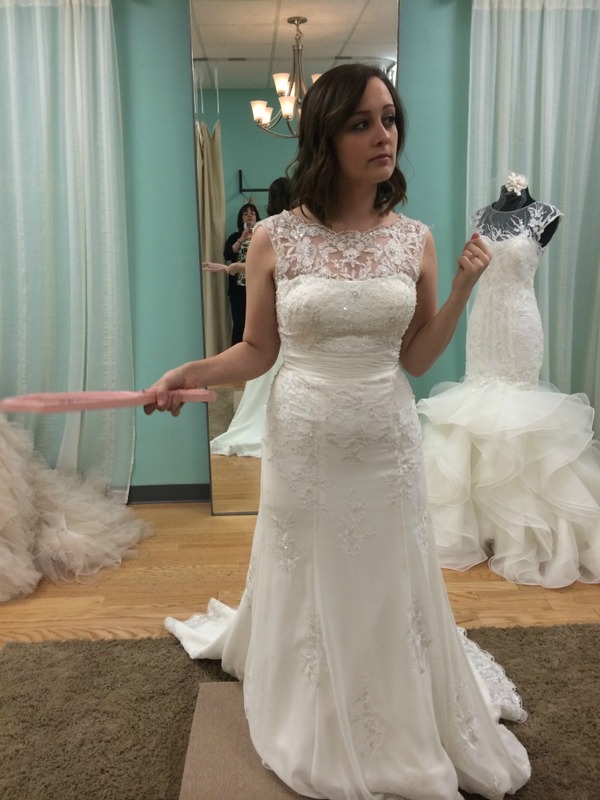 I wanted to share with you today what my wedding dress shopping experience was like. I am not someone who likes to try on clothes, and I am also someone who is not very decisive. And to top it all off, my mom and I had very different ideas about what my dress should look like. 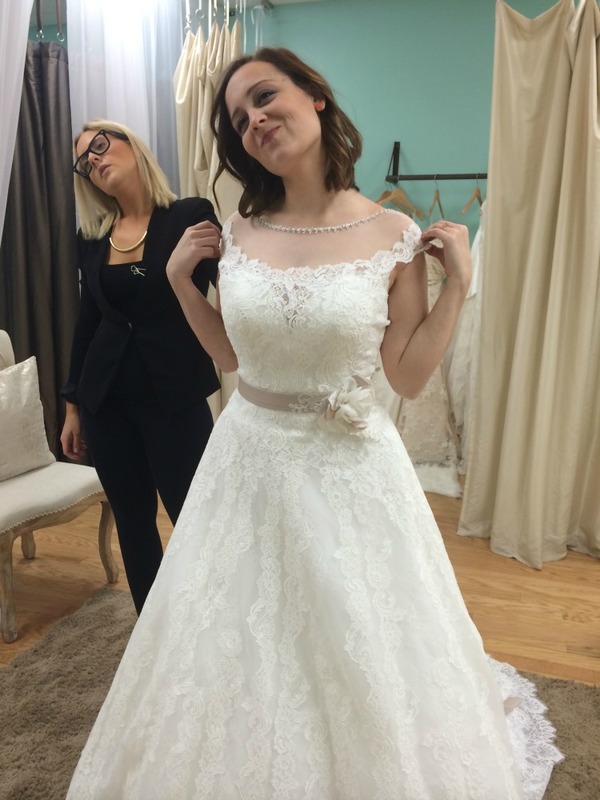 We purchased my dress last April, and it is being altered right now. I am SO excited to finally wear it! We had planned a full day of dress shopping where we were going to go to the big chain stores with my sisters, Dave's mom and sister, and my grandmother. 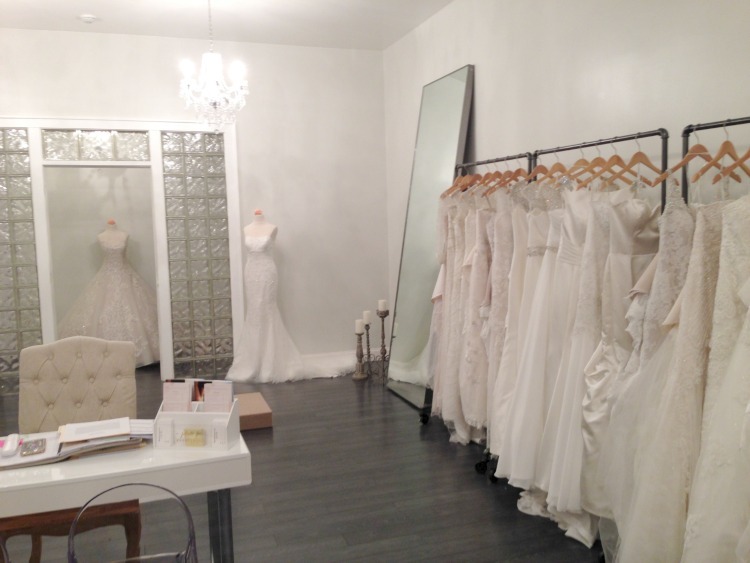 I wanted to go to a local boutique called Stella's Bridal Boutique, because I knew they had a good selection of all different types of gowns. Our appointment at Stella's was awesome. It was a private appointment, so we had the whole shop to ourselves, which at the time was just me and my mom. I started by giving Stella and her assistant my wish list: ivory, lace, mermaid or trumpet. Now where my mom and I differed was in what the top should look like. I had an open mind, but wanted to wear strapless. My mom was adamant that I wear something with straps or sleeves. Disclaimer: none of these are my dress. So rest assured. You can see just how comfortable I am in each of these photos (aka not). I liked things about each of these gowns, but none of them were "the one." I mean... the wedgie picking says it all. I really liked this one, especially with the illusion lace top. But ultimately it wasn't right. This was my mom's pick. My face says everything you need to know. My dress was the last one I tried on at Stella's that morning. As soon as I had it on, I just knew. However, I didn't say yes to it until I tried it on twice more, and showed all my ladies. Like I said before, I'm really indecisive. I ultimately knew it was the one because shopping at the other stores, I was just comparing every other dress to that one. Even though it is fairly simple, nothing else I tried on held a candle to it. 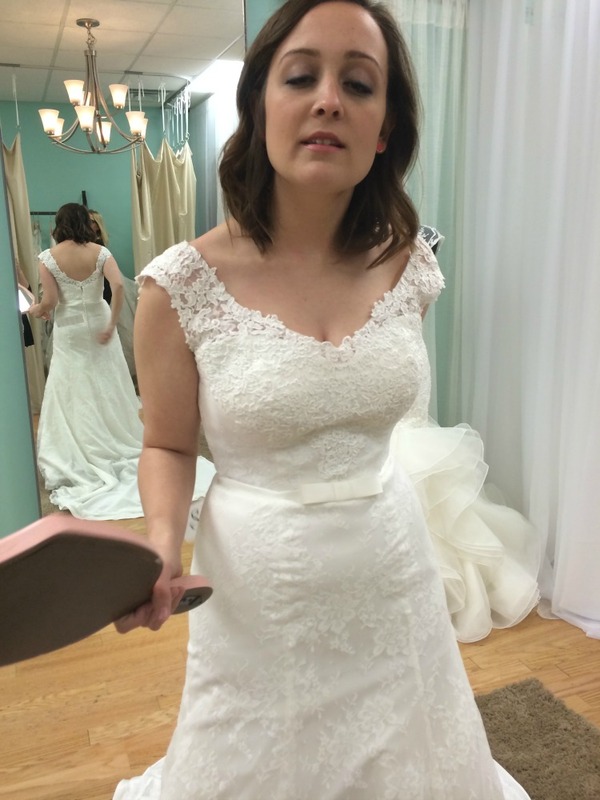 I ended up winning on the strapless/sleeved debate, and I just love how it looks. I guess they are right when they say that once you know, you know.